The boardwalk is less than 1 block, Tropicana Casino is across the street, Hilton Casino within 4 blocks, Trump Plaza Casino within 4 blocks, Caesars Casino within 4 blocks, Ballys Casino within 6 blocks, Taj Mahal Casino within 12 blocks, Showboat Casino within 12 blocks, Showboat Casino within 12 blocks. Atlantic City Aquarium within 2 miles. The pier at Ceasars is within 5 blocks. Sand Castle Stadium only 6 miles. Harrahs Casino, Borgata Casino, Trump Marina Casino are all within 5 miles. 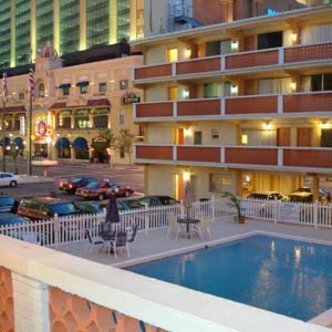 Stay at the Ascot Motel by the Boardwalk, a Magnuson Hotels affiliate, while enjoying the atmosphere of Atlantic City.